Why are Some Links Stronger Than Others? Why are Homepage Links Strong? How Can Internal Linking be Used to Improve Your Rankings? What if you make infinity internal links? Why Should You Create a Silo? Most SEO beginners have heard of backlinks - links from someone else's website. Backlinks to your site will (in general) help boost your position in the search engine results pages (SERPs). Your pages need authority to rank, but getting links from other websites takes time and effort; in many cases, getting backlinks can cost money. Usually people talk about backlinks from one site to another site. There are also internal links. Links from one site to somewhere else on that same site. Internal links have a similar effect for SEO as do external backlinks. If a there is a page that you link to from many pages on your own site, then that page will tend to rank higher in the search engine results pages (SERPs). Internal links do not create authority the same way that backlinks from external sites do. Rather, internal links distribute the authority that has already been passed to your site from those backlinks. Good internal link structure is important because internal links allow you to focus your site's authority into ranking important pages rather than wasting it on junk. Another piece of information that most SEO beginners are aware of is that some links are stronger than other links. On a technical level, this is because backlinks get their power from other backlinks. If a webpage has zero links pointed at it (0 backlinks) and that webpage then creates a backlink to your site, that backlink will be weak. In contrast, if a webpage has many links pointed at it (many backlinks), backlinks from that webpage to your site will be much stronger. 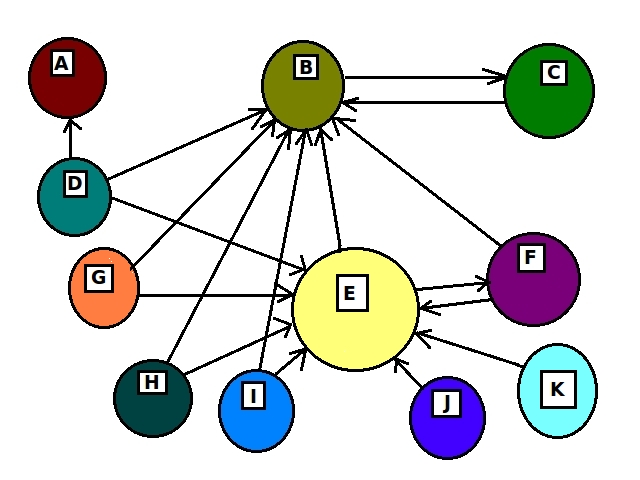 For example, in the example below (pulled from Wikimedia Commons) a backlink from site E would be much more powerful than a backlink from site K.
Note: While the general concept remains unchanged, note that this image was originally created to demonstrate PageRank, which is no longer publically updated. External Backlinks. The more obvious of the two reasons. The most common page for others to link to is to the homepage, so of course this page will be quite powerful given that fact. Internal Linking. The more interesting and commonly overlooked reason. In most cases, every page on your website will have a link back to your homepage. This means that any time that a backlink is built from another website to any page on your site--any page at all--your homepage is only one step away. This means that your homepage is going to get tons of power from no matter how your backlinks are distributed. Homepage links aren't automatically powerful; they're powerful because the standard way of structuring websites makes them powerful under Google's algorithms. Find posts on your website that are of lesser importance, such as pages that have low search volume or a poor conversion rate. In the text of the pages of lesser importance, add links to the pages of greater importance. This helps focus your link equity into pages that will be able to take advantage of that power. Top level pages, such as those linked to in a site's main navigation bar, tend to rank highly. A large part of this is because these pages have internal links to them from each and every page on the website. Any link to any page on a website will indirectly boost pages that are only one tier away more than that same link will boost pages that require multiple tiers of navigation. This means that the pages that you choose to include in your internal navigation menus will receive a lot of authority. Internal links don't create authority or power; rather, they distribute the power and authority that external backlinks have brought into your website. Cramming an excessive number of links into a a page on your website will not generate more power; it will take the same amount of total power and distribute it across your a larger number of pages (meaning that each individual page gets less power). In general, it's better to rank a smaller number of pages at the top of the SERPs (top 10, ideally #1) than it is to rank many pages on page #2 and beyond. Obligatory cliche but accurate advice. 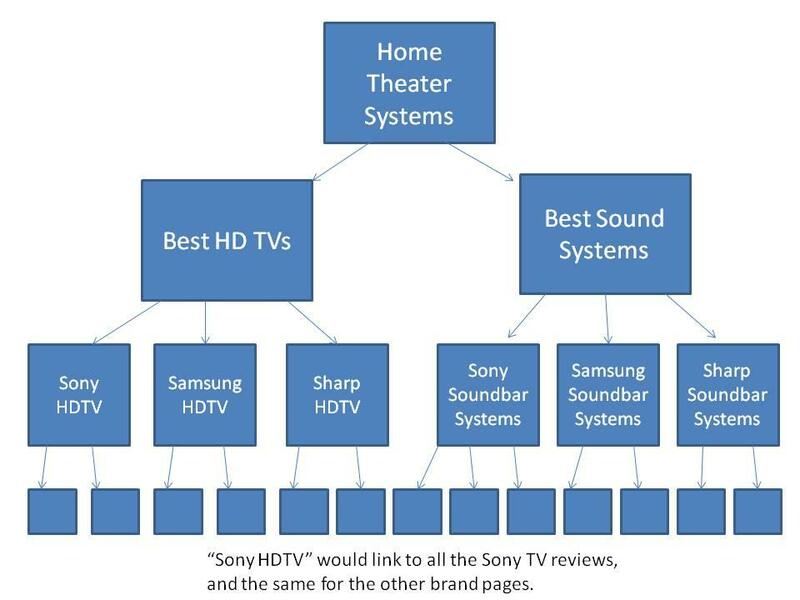 Credit to this website for this diagram. In the example above, if you're on the "Buy Aluminium Baseball Bats" page, there should be a menu/sidebar/footer/whatever that has links to the parent category "Buy Baseball Bats" and to the sibling pages "Buy wooden baseball bats" and "Buy tee-ball bats." In addition to a directory, when using a silo structure, it is ideal to set up your internal linking so that there is occasional interlinking to other pages in the silo within the body of the main text of the landing page. For example, again referencing the example silo above, "These aluminium bats are great for bashing in the skulls of the undead. If you prefer a fresh oak scent while you ride out the the end of human civilization, you might check out some aluminium options. The goal here being that you set up your pages so that links to particular categories will allow authority/"link juice" to flow to the other pages within the same silo. This allows you to get a lot more bang for your buck with backlinks to large sites (not to mention it's also good for user experience and conversion rate). The Sitewide Sidebar, Footer, and/or Other Navigation Menus - Link to the Parent Pages of Each Silo. For inner pages on a domain to receive authority, they must be connected to the rest of the site. It is important to design your site so that all pages (or at least all of the pages you care about ranking) are hooked up to the "power grid" so that they can benefit from the authority passed to your site from external backlinks. Because linking to every single page from the sidebar is impractical for any site larger than twenty pages or so, the standard way to do this is to link to the parent pages of each category from a sidebar, footer, or other navigation menu. This allows for the authority from any link pointed at any given page to flow to each of those parent pages, which each contain their own directories of links to their children to which authority is then funneled. To Rank Large Sites. The main difference in terms of ranking large sites is that you're looking more at building silos (categories and subcategories) and then targeting pages as groups, generally with a focus on the parent pages in those categories and a smaller number of links to inner pages within those silos. For an example like the sports site shown previously, you're going to generally point tons of links at the home page, lots of links at "Buy Baseball Equipment" and "Buy Football Equipment," a good amount of links at "Buy Baseball Bats and "Buy Baseball Mitts" and some/intermittent/occasional links at "Buy Aluminium Baseball Bats," "Buy Wooden Baseball Bats," and the like. Rank highly in the SERPs with minimal external backlinks because they're able to take advantage of the site's overall authority. These two factors are a large part of why well-known authority sites tend to have new pages indexed quickly and why pages on authority sites tend to rank well even without explicit offpage linkbuilding being done. Effective use of internal linking an extremely powerful and consistently underestimated aspect of ranking a website in the SERPs. In fact, it is one of many ways that onpage optimization gets overlooked despite the extreme power of onpage optimization. If you like making money from search engine optimization, improve your internal linking and onpage optimization.